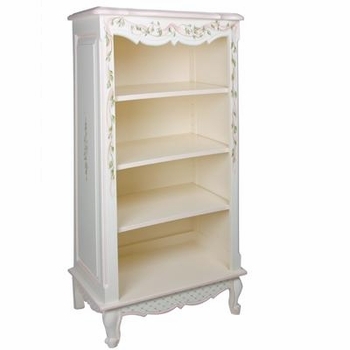 Art For Kids narrow french bookcase with ribbons & roses motif is an elegant and versatile addition to your decor. The small bookcase features a classic design and is a wonderful place to way display nic nacs and place books. It is made from 100% alder and birch wood. It can also be done with or without applique moulding and in many finishes to go with any room. Dimensions - Width: 26" , Depth: 19" , Height: 53 1/2"
The bookcase is custom made to order and ships directly from the manufacturer. For further information or to speak with one of our design associates, please call us at 203.655.0185. Wood chip samples available upon request.